Fresh Wind Fresh Fire What Happens When Gods Spirit Invades the Hearts of His People 2003 publication. About Jim Cymbala (Author) : Jim Cymbala is a published author of children's books and young adult books. 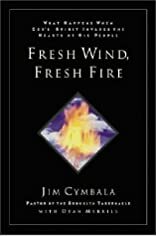 Some of the published credits of Jim Cymbala include Fresh Faith.